The important organic compound, which is required in human body as a nutrient in limited amounts, is known as Vitamins. As the vitamins cannot be synthesized in human body in sufficient quantities, these are taken from the outside sources. There are several importance of Vitamins. They help to heal wounds and strengthen the immune system. It converts food into energy and repairs cellular damage. It helps to form Collagen. 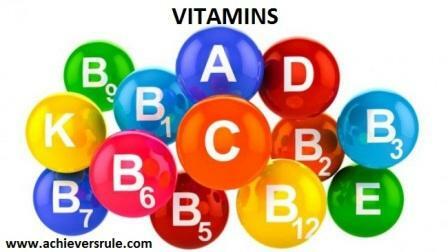 Deficiency of Vitamins can lead to several diseases in human body. Food Sources- Liver, Orange, Green Vegetables, Fish, Soya Milk, Carrots, Milk etc. Food Sources- Liver, Eggs, Potatoes, Oatmeal, Vegetables etc. Food Sources- Dairy Products, Bananas, Green Beans etc. Food Sources- Fish, eggs, meat, Mushrooms, vegetables etc.